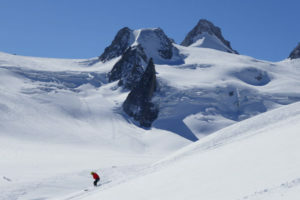 Freeride skiing in Chamonix: ideal backcountry skiing tour! 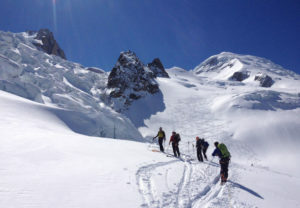 Our Chamonix Freeride weeks are a dream come true for everyone interested in backcountry skiing. 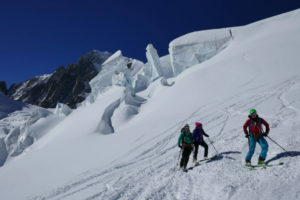 During the week you’ll get a chance to experience the scenic backcountry around Mont Blanc in the company of an UIAGM-licensed mountain guide. The Chamonix Mont Blanc area will leave nobody cold. The most experienced free riders from all corners of the world come to ski this ski areas. A real skier’s paradise! Our guides know the backcountry terrain and weather conditions extremely well and will make sure you’ll ski the best spots. 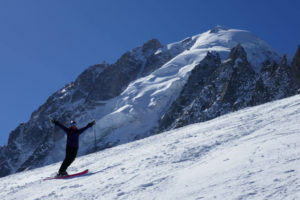 We will ski at the Grands Montets, Chamonix most famous off-piste ski area. This ski resort has an immense range of off piste skiing. The snow stays light and fresh, due to the North Face of the Aiguille Verte which shields it from the sun. 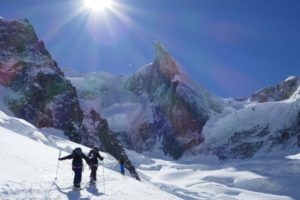 We’ll ride one of the most legendary Glaciers of all time – the Vallée Blanche route, where you get to see the most amazing views of Mont Blanc. Courmayeur (ITA) is just a 20 Minutes drive trough the Mont Blanc tunnel away from Chamonix and offers very nice off piste options. A real Italian ski day! We will check out the snow at Brévent – Flégere ski area accesible form Chamonix town today. The brand new Sky way cable car brings us up to Punta Helbronner. We ride the South side of Mont Blanc, on the Toule Glacier down into Courmayeur. We require all participants to carry full avalanche safety equipment (beacon, probe, shovel) and to obey given instructions to ensure amazing powder days. Do you only have a day or two for skiing in Chamonix? 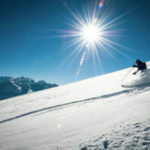 We are happy to offer you a great shorter off-piste experience! Let us know. Let us know if we can help you finding your perfect accommodation. 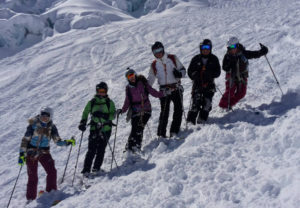 Thank you Mirjam and Stefanie for skiing with us in Chamonix! It was great to have you here and we’re looking forward to ski with you soon again! !